How far are parliaments engaged in implementation, and how far should they be? Do parliaments advance or hinder human rights compliance? Is it ever justifiable for parliaments to defy judgments of the Court? And how significant is the role played by the Parliamentary Assembly of the Council of Europe? Drawing on the fields of international law, international relations, political science, and political philosophy, the book argues that adverse human rights judgments not only confer obligations on parliamentarians but also create opportunities for them to develop influential interpretations of human rights and enhance their own democratic legitimacy. 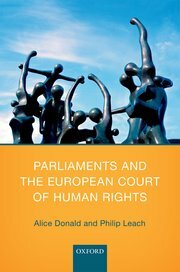 It makes an authoritative contribution to debate about the future of the European and other supranational human rights mechanisms and the broader relationship between democracy, human rights, and legitimate authority. 'Since its inception, the European Convention on Human Rights has been a beacon of hope to gay men and lesbians in Europe. 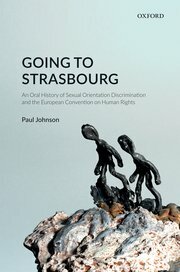 Going to Strasbourg: An Oral History of Sexual Orientation Discrimination and the European Convention on Human Rights provides a comprehensive account of how individuals in the United Kingdom have utilized the Convention, by way of making applications to its organs in Strasbourg in order to challenge sexual orientation discrimination. The book launch will feature, apart from the author, short talks by Lord Cashman and a number of former applicants in Strasbourg. For more information on attending this special event, see here.